Solar arrays, a public art courtyard, and a picnic-friendly “park within a park" make the 7,210-seat CHS Field the first ballpark to meet Minnesota sustainable building standards. CHS Field, the new home of the Double-A St. Paul (Minn.) Saints, bills itself as the “greenest ballpark in America.” Ryan Cos. (GC) and its design partners—Ryan A+E, Inc. (AOR), Snow Kreilich Architects, and AECOM (sports architect), envisioned a greenspace connecting the city’s Lowertown arts district to nearby riverfront parks and trails. +Owner: City of St. Paul, Minn.
+Architect of record: Ryan A+E, Inc. The ballpark is the first such venue to meet Minnesota’s B3 Sustainable Building 2030 Energy Standards. The 13-acre site had to be completely remediated to remove chlorine solvents, coal tar, and lead from its days as a manufacturing hub. Five underground storage tanks had to be removed. Fifteen percent of the ballpark’s power is derived from 100kw solar arrays. 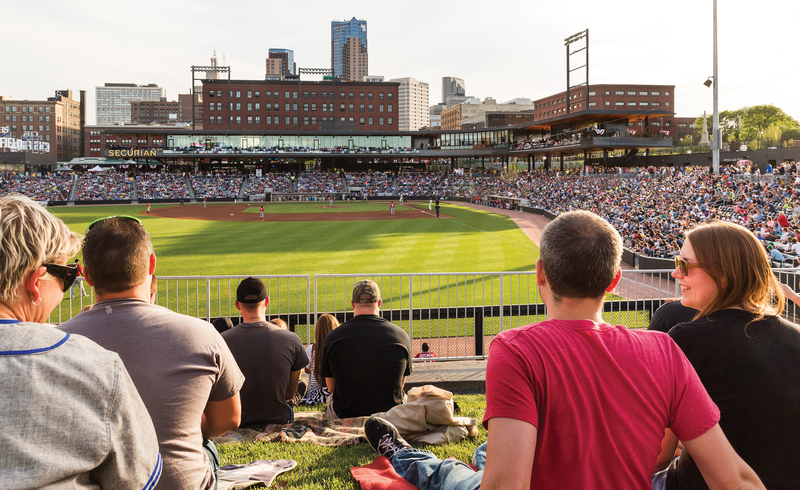 CHS Field collects stormwater from the stadium—and from the roofs of nearby buildings. The runoff is treated via sand filters, tree trenches, and rain gardens to prevent direct flow into the Mississippi. The 7,210-seat stadium provides room for another thousand fans on its picnic-friendly “park within a park.” There are outdoor terraces at the suite level, berm seating and park space in left field, and a terrace off the adjacent main street. Thirty bus lines stop at the front gates. The Building Team was responsive to the local community, which wanted an existing dog park at the site preserved, a public art courtyard in the ballpark, and a second entrance on the east side; all these requests were accommodated. Restrooms in the ballpark are kept open during the local farmers’ market. The front gates are left open during off-hours so that visitors can stroll around the concourse. Last year, the Saints went 74-26 to win their division. They averaged 8,091 fans over 50 games—20% of their entire league’s attendance. Who said green doesn’t pay? The concourse allows fans to navigate 360 degrees around the 7,210-seat ballpark. Photo: Paul Crosby Photography/Courtesy Snow Kreilich Architects. Click to enlarge.